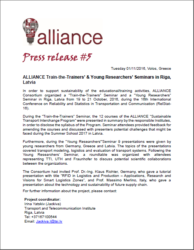 In order to support sustainability of the educational/training activities, ALLIANCE Consortium organized a “Train-the-Trainers” Seminar and a “Young Researchers” Seminar in Riga, Latvia from 19 to 21 October, 2016, during the 16th International Conference on Reliability and Statistics in Transportation and Communication (RelStat- 16). During the “Train-the-Trainers” Seminar, the 12 courses of the ALLIANCE “Sustainable Transport Interchange Program” were presented in summary by the responsible Institutes, in order to disclose the syllabus of the Program. Seminar attendees provided feedback for amending the courses and discussed with presenters potential challenges that might be faced during the Summer School 2017 in Latvia. Furthermore, during the “Young Researchers’”Seminar 9 presentations were given by young researchers from Germany, Greece and Latvia. The topics of the presentations covered transport modeling, logistics and evaluation of transport systems. Following the Young Researchers’ Seminar, a roundtable was organized with attendees representing TTI, UTH and Fraunhofer to discuss potential scientific collaborations between the organizations. In addition, the Consortium had invited Prof. Dr.-Ing. Klaus Richter, Germany, who gave a tutorial presentation with title “RFID in Logistics and Production – Applications, Research and Visions for Smart Logistics Zones”, and Prof. Massimo Merlino, Italy, who gave a presentation about the technology and sustainability of future supply chain.